Silver Creek Press Blog: Try Walking a Mile in Employees’ Shoes – You Might Learn a Few Valuable Lessons! Try Walking a Mile in Employees’ Shoes – You Might Learn a Few Valuable Lessons! The hit reality TV show “Undercover Boss” follows managers of large corporations as they give up a soft boardroom chair for a week of hard work on the line. The jobs they must learn and the problems and people they encounter make for an interesting hour of viewing. At the end of the week, the manager “comes clean” with employees, offering positive feedback and usually money or perks to acknowledge high-performers. Under-performers receive critical feedback and training. The show profiles employees who are company loyal with a few “Negative Nellies” thrown in to add some drama. Setting aside from the ethical question of managers pretending to be “line workers”, the idea behind walking a mile in employees’ shoes has merit. There is value in managers serving customers directly and experiencing employees’ everyday challenges. Have you ever overheard an employee say: “Those people up there in the office should come down once in a while and see what it’s really like to work here.” Although, their choice of words is sometimes much less polite! While working on the line, managers gain an unfiltered view of the nitty-gritty challenges, identifying and solving problems that may have otherwise gone undetected. After experiencing a day-in-the life of employees, managers are often surprised at the exceptional skill and positive attitudes of many employees. 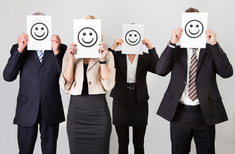 The exercise may be good for employee morale however the intimidation factor for employees cannot be under-estimated. Managers who consider embarking on this journey must clearly communicate their intent and must diligently not be the boss. Managers are there to learn, help, understand and support. Kind words and recognition are essential and if critique of individual performance is necessary, it must be given privately and be constructive. And, it is not out of the question for an employee to walk a mile in a manager’s shoes for a few days. This reverse exercise may debunk the myth that “managers have it easy” and create understanding about the challenges faced by people in leadership roles in the organization. workplace. For more information, visit her website at www.silvercreekpress.ca.